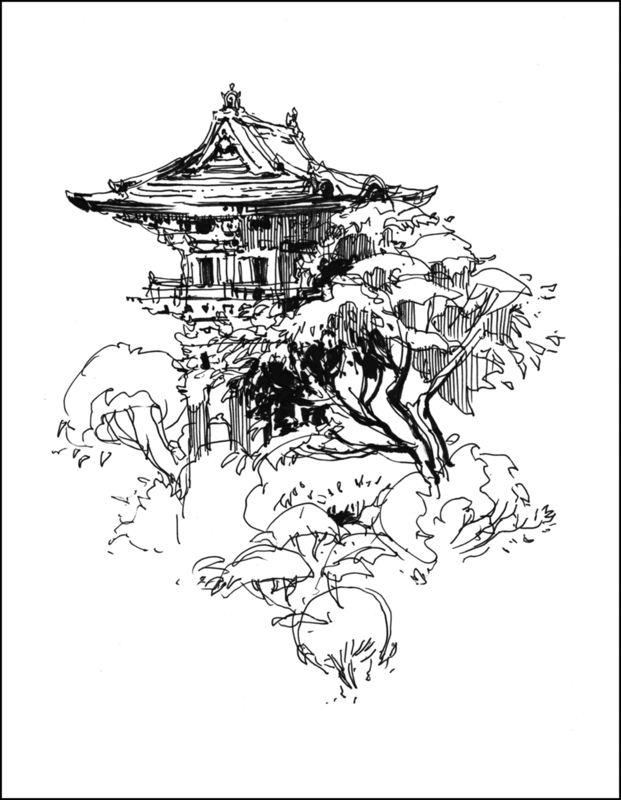 Here’s some quick inks from a return trip to the Japanese Garden in Golden Gate Park. 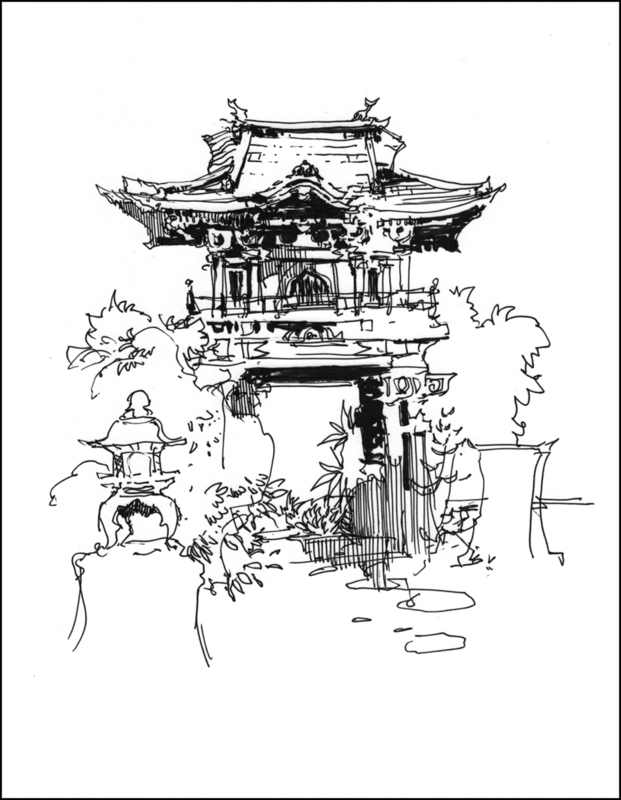 We spent the day touring with Urban Sketcher Simo Capecchi and her family. This is always a great spot to go with sketchers. She is on the way to Portland for the Urban Sketchers Symposium. I really wish I could attend this year. Unfortunately it’s happening right at the same time as we have to move house from San Francisco to Montreal. I hope I can make next years – I hear it might be a European destination. hmm tips…lets see…..one thing that helps me with larger objects is to back off – draw from further away. If I’m too close to a building or block of houses, I can’t see the perspective. Also getting at an angle or some how being above or below helps me, instead of trying to sketch a structure ‘flat on’. Again, helps me see the perspective. Also for me, I have to chose a focal point – an interesting doorway or window, and the whole image is designed to move the eye to the focal point. That helps organize any image. Leave out detail in the unimportant areas, increase detail, contrast and color in the focus. That’s what comes to mind. Beyond of course the ‘draw every day’ mantra. I’ve only been drawing “seriously” for 6 or 7 years myself – but I’ve been aiming for as close to 4 hours a day as I can get. That’s my goal. Sometimes it’s 16 hours a day and nothing for the rest of the week. But I try to make it average out around 4 a day. Another tip for drawing large-scale subjects – I block out the basic shapes of the main parts in light pencil first, it makes the whole process feel a bit less intimidating. Also, experiment with mark-making. I find that a range of marks can make effective texture and contrast in a pen drawing. 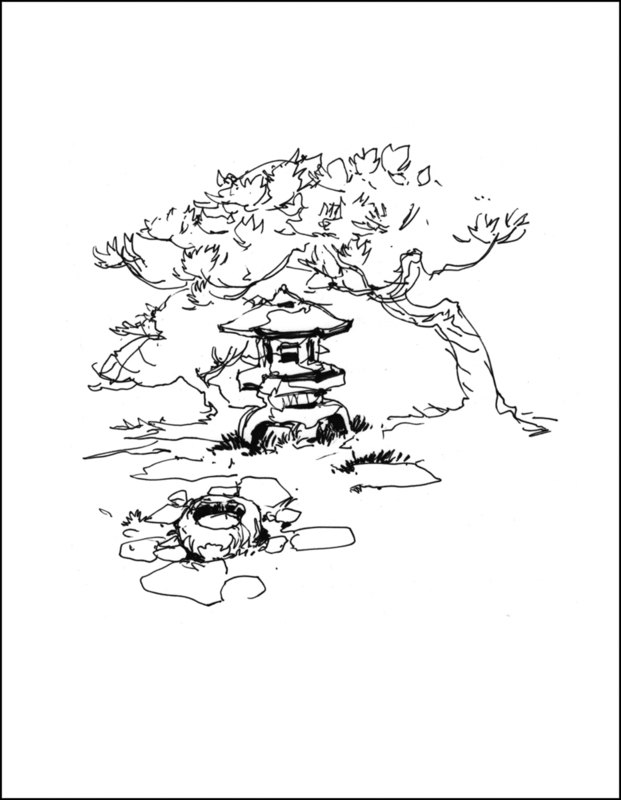 I’m working on a few Japanese garden drawings at the mo – these are wonderful! I love those, Marc! They’re beautiful.